Ackermann’s Repository of Arts, March 1812. 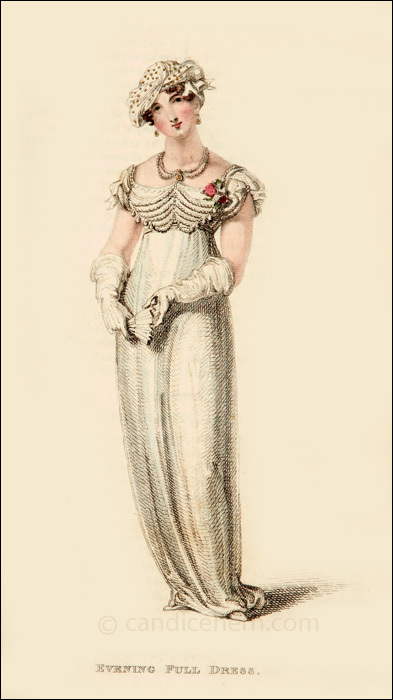 This is a pretty dress, very typical of 1812, but the most interesting thing here may be the footnote, explaining that the real dress is much more fashionable than represented by the artist! In the first year of this publication, many of the dresses represented in the prints, as well as most of the fashion commentary, were provided by the famous modiste, Madame Lanchester. The designer of this dress was Mrs. Gill, who had once apprenticed to Madame Lanchester. The effusive comments here about Mrs. Gill suggest that her mentor may still have been penning some of the fashion commentary and description. And it would be in keeping with Madame Lanchester’s vanity to chastise the artist! 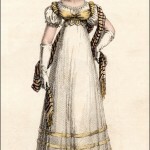 “A round robe of white imperial crape, or gossamer net, worn over white satin; short Spanish pointed sleeves, caught up in the center of the arm with pearls or white beads; wide stomacher of the same, finished with pendant drops on each side; a narrow vandyke trimming at the edge of the bosom in the front; the back and shoulders finished with a row of white beads. A Circassian turban of gold spotted muslin or tissue, embellished on the left side with bows and ends of white ribbon. Hair divided irregularly on the forehead, and in curls on each side. 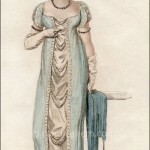 Necklace and earring of brilliants, or two rows of pearl, with a drop in the center; bracelets en suite. White satin slippers, with gold buttons or clasp. French kid gloves, below the elbow. Fan of carved ivory or gold-spangled crape. 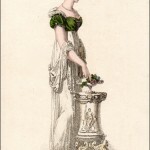 A small bouquet placed entirely at the left of the bosom.